Upaya Social Ventures selected two more companies for our investment portfolio of social enterprises creating jobs for the poorest of the poor. In March 2015, Upaya exited its investment in Delhi-based Justrojgar after its shares were bought back by the entrepreneur, Ajaya Mohapatra. This is the first full exit of a partner from Upaya's LiftUP Project. The organization will re-invest 100% the returns from the transaction into a future LiftUP Project partner in a manner consistent with its Pioneering Capital model. Upaya initially invested in the Delhi-based skilling company in 2012. Upaya Social Ventures and Drishtee Development and Communications Ltd. are proud to announce a social venture collaboration that will create new opportunities for rural artisans to rely on their trade to earn a stable and dignified living. This pilot project with Drishtee will fill gaps in regional value chains by connecting groups of producers in rural communities across Assam, Bihar, and Uttar Pradesh with raw material suppliers and wholesale buyers of their products. The pilot provides these groups - known as Community-Owned Enterprises (COEs) - with the technical training, management infrastructure, and market linkages needed for community-level entrepreneurship to thrive beyond their immediate area. “In building Drishtee, we saw a new opportunity in organizing and formalizing the thousands of sole proprietors in or adjacent to our network,” said Drishtee Co-Founder and Managing Director Satyan Mishra. “Right now, village level producers are generally on their own. They are sole proprietors with very little reach outside their immediate area, and do not have the means or ability to develop customer relationships with larger clients for their product or service,” said Mishra. Drishtee is a social enterprise that provides goods and services across rural India through locally owned village kiosk franchises. The kiosks provide services such as health, education, banking, microfinance, and livelihood services, as well as market linkages for independent farmers and other agri-processors. The Drishtee network currently serves the needs of over 14,000 rural households. “This pilot with Drishtee - a successful company in its own right - is somewhat different from the typical business Upaya incubates through the LiftUP Project. However, the pilot’s ambitious and unique model provides an opportunity to secure stable, dignified livelihoods for small scale rural producers by connecting them with larger regional and national buyers,” said Upaya’s Director, Business Development Sreejith Nedumpully. The initial pilot will focus on incubation of three to four COEs in the handloom textile and apparel production value chain. Per the initial plan, each of the prospective COEs will perform different steps in the process including thread spinning, weaving, sewing and garment finishing. Over the initial months of the pilot, Drishtee will organize and formalize the groups, provide training in design and quality control, and provide the necessary connections with wholesale customers. Each COE affiliated with Drishtee will employ at least 10 -15 people on a consistent basis. “By building individual skills and allowing each person to focus on a piece of the production process, each participant can earn a living without fully bearing the burden of managing their own sole proprietorship” said Nedumpully. At the time the company is launched, it will be lead by Vikas Mukundan, a Drishtee veteran who was selected to head up the new project. Throughout the process, Vikas will be supported by Mishra as well as members of the Upaya team. As the pilot reaches its one-year mark, Upaya and Drishtee will review the progress toward the milestone goals and consider an expansion of the program. Assam-based natural dinnerware producer Tamul Plates Marketing Pvt. Ltd. is pleased to announce that it has received a seed investment from Upaya Social Ventures through Upaya’s LiftUP Project. Based in the Barpeta District of Assam, Tamul Plates produces and markets high-quality, all-natural disposable plates and bowls made from arecanut (palm) tree leaves under the “Tambul Leaf Plates” brand. Disposable arecanut dinnerware is hygienic, chemical-free, compostable, microwave safe, and in high demand among urban consumers around the world. The production and sale of natural arecanut dinnerware not only reduces the deforestation and pollution associated with the production of traditional disposable dishes, but also provides a viable livelihood to disadvantaged communities. “Unemployment is the root cause of so many problems plaguing the Northeast today, and Tamul Plates was launched to create new opportunities for rural youth to earn a dependable income,” said Tamul Plates CEO Arindam Dasgupta. “We feel that this partnership with Upaya affords us the resources needed to expand our operations and be a positive economic force in these communities,” said Dasgupta. 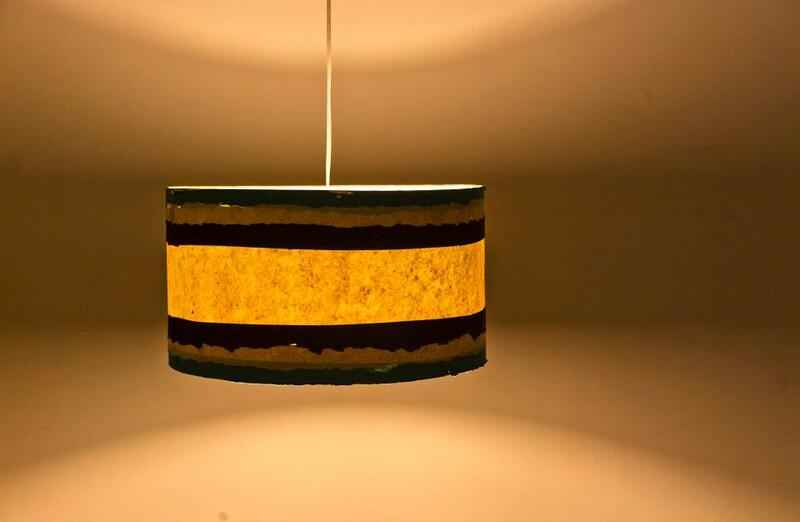 Tamul Plates produces dinnerware through a network of affiliates across tribal regions of Northeast India. The company ensures that each affiliate has the skills and machinery needed to produce superior-quality dinnerware. These affiliates are located in communities otherwise struggling with stubbornly high rates of unemployment, especially as heavy annual monsoons and floods diminish the ability of farmers to earn a dependable income from conventional agriculture alone. Two men work a pair of presses in a community-run Tamul Plates production unit. A woman cleans recently collected arecanut leaves to prepare them for pressing. “There are more than 100,000 hectares of arecanut plantation in Northeast India - one of the poorest and most backward areas of the country - but there is virtually no one connecting these small farmers to the equipment and support needed to produce high-quality disposable arecanut leaf dinnerware,” said Upaya’s Director, Business Development Sreejith Nedumpully. “Upaya is very excited to be working with Arindam and his team as we believe they can provide those services and be a major employer in poor tribal communities across the Northeast,” said Nedumpully. Upaya Social Ventures has been selected by the trustees of The International Foundation to receive grant funding to support the organization’s LiftUP Project work. Supporting world-wide development since its founding in 1948, the International Foundation continually looks for opportunities to learn from experience and to gain an understanding of what produces satisfactory results in the promotion of sustainable development. Starting in November 2013, Upaya Social Ventures and the Bill & Melinda Gates Foundation are teaming up to incubate a Foundation-backed urban sanitation venture within Upaya's LiftUP Project framework. Through this collaboration, members of the Upaya team will work with the founder of Pune-based Samagra to explore and refine the promising start-up's business model, and prepare the venture for follow-on growth funding. Upaya has decided to wind down its LiftUP Project partnership with Delhi-based Justrojgar following a difference with management about operating practices. With this change, Upaya will continue to hold its equity position in the company, however, the Upaya team will no longer provide technical support that is central to its LiftUP Project partnerships. “While we are altering the structure of our partnership with Justrojgar, we maintain our fundamental belief that the facilities management sector - both commercial and residential - represents a tremendous opportunity to create large-scale employment for ultra poor slumdwellers” said Upaya Director, Business Development Sreejith Nedumpully. Upaya Social Ventures is proud to announce that Sreejith Nedumpully has joined the organization as Director, Business Development. In his role, Sreejith will lead Upaya’s LiftUP Project in India. Sreejith brings to Upaya over 12 years of experience in retail, emerging markets, financial inclusion, SME promotion, incubation and entrepreneurship. Most recently, he was the Co-Founder and Managing Director of ROPE International, a premium brand of natural, handmade lifestyle products from renewable materials. Today the company creates employment opportunities for over 1,000 rural artisans through its village cluster model, and wholesales its products to a variety of well-recognized domestic and international retailers. Throughout his career, Sreejith has been involved with several social enterprise efforts including work with TeNeT Group, IIT Madras, Villgro Innovations Foundation, and the DHAN Foundation, and has consulted for organizations including Business and Finance Consulting GmbH Zurich, Women on Wings, the Sir Ratan Tata Trust, and Simpa Networks. Nedumpully’s arrival follows the spring departure of Upaya Co-Founder Sriram Gutta. Gutta was recently named a Fulbright scholar and is pursuing a Masters degree. 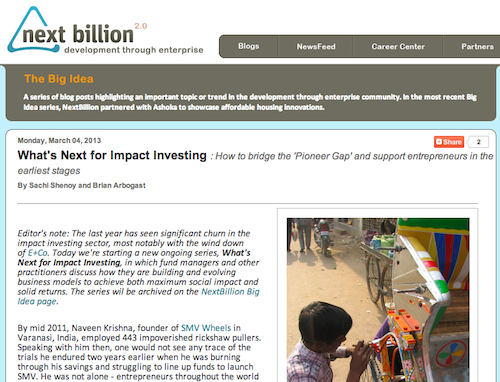 Upaya's Executive Director Sachi Shenoy and Advisor Brian Arbogast share the story of the organization's evolution and introduce the idea of "Pioneer Capital" in NextBillion's "What's Next for Impact Investing" Series. Upaya proudly congratulates Ajaya Mohapatra and the Justrojgar team for being named First Runner-up in the non-student category of the Power to Empower business plan competition. A partnership between the National Skill Development Corporation (NSDC) and India@75, Power to Empower "[encourages] innovative and implementable business solutions that contribute to the development of a sustainable vocational skills ecosystem in India." This year's competition received 234 nominations and over 100 applications. "We are extremely excited to see Justrojgar recognized by the NSDC for its potential to transform the lives of the urban poor," said Sriram Gutta, Upaya's Director of Business Development. "By training slum-dwellers on needed skills and ensuring they get social benefits, Justrojgar is creating job opportunities in a market with enormous potential," Gutta said. As First Runner-up, Justrojgar will receive a free delegate pass to the Sankalp Unconvention Summit 2013 courtesy of the Villgro Innovations Foundation, the opportunity to participate in the Deakin University’s (Australia) Sponsored Entrepreneurship program, a Complimentary TiE Annual Associate Membership, and a bundle of classes and mentorning courtesy of the Sunstone Business School. Ashish Gupta (left) and Ajaya Mohapatra present to the judges in the competition's final round. In January Samridhi management chose to move the location of its first Bulk Milk Chilling (BMC) facility before the second was brought online. The company needed to better space the collection centers to reach the largest number of dairy farming families. As a result, 46 of the original Samridhi employees - including several women who had been profiled on our website - are no longer within the zone of service and have been transitioned out of their roles. However, the company was careful not to leave them in a precarious situation. Samridhi management took steps to accelerate the livestock ownership transfer to the individual employees and a large majority now own the cows and goats that had been in their care. This was a very difficult decision for both Samridhi and Upaya, however, we hope to re-incorporate these villages into the Samridhi supply chain as the company continues to expand. Unrelated, Samridhi Co-Founder and CEO Lokesh Singh has transitioned out of his day-to-day management role with the company and has been replaced as CEO by his Co-Founder Niraj Pareek. Biswanath Swain, who has been with the company since its inception, has filled the COO role. The Upaya team has been part of this transition planning and is working closely with both Niraj and Biswanath to ensure that the company’s operations continue to follow its plan for growth. What does all this mean for Upaya? We have always known that startup enterprises face a unique set of challenges and that, because of their size, the changes they experience can feel quite dramatic. As such, we intentionally designed our LiftUP Project to be patient with investments and work alongside partners so they can have the confidence to make adjustments as issues arise. Both Sriram and Sachi were in Lucknow with the Samridhi team in mid-January and we continue to be optimistic that the company will be able to navigate through this period of change. In fact, during our visit we were happy to find that Samridhi was reaching the same percentage of ultra poor families as before and the company was enthusiastically embraced in the communities where it is operating. From the beginning of our partnership, we have had full faith in the Samridhi model to create jobs and improve livelihoods. Despite these recent changes, this belief has not wavered. We thank you for your continued support and please do not hesitate to contact a member of the Upaya team directly if you have any questions. Committed to skilling and securing employment for the millions of potential service industry workers currently living in ultra poverty, Delhi-based Justrojgar is proud to announce that it has secured an initial equity investment from Upaya Social Ventures. Terms of the deal were not disclosed. “This strategic partnership will afford Justrojgar the resources and expertise needed to connect those living in extreme poverty with an ever-expanding array of opportunities in service sector,” said Ajaya Mohapatra, Managing Director of Techpeople, the parent company of Justrojgar. “Together we are working to ensure rojgar (jobs) for the poor in a way that is just and equitable for all,” said Mohapatra. Justrojgar was designed as a social venture to bridge the demand-supply gap in the service industry by creating a comprehensive ecosystem to train job seekers and link them with potential employers. For corporate clients, service employees can fill roles such as janitors, security guards, and porters, while in a domestic setting these positions can include full- and part-time housekeepers, cooks, doormen, and caretakers. Through its partnership with Upaya, Justrojgar will build on its pilot National Capital Region operations to establish a national footprint for skilling and placing the manpower needed to fill the massive national labor market shortage for formalized service work. “By allowing a variety of corporate and domestic employers to confidently source capable and reliable employees, Justrojgar is making it possible for those living in the furthest depths of poverty to directly benefit from the country’s economic growth,” said Sachi Shenoy, Upaya’s Executive Director. “Upaya has been impressed by what the Justojgar team has accomplished so far and see great potential in this model,” she said. The partnership coincides with the launch of www.justrojgar.com, India’s first-ever integrated online employment exchange for the service sector. The company envisions the website as a complement to its other efforts to recruit, train, place, and support service sector employees. Justrojgar is also fostering on-the-ground partnerships with the government, NGOs, corporates, industries, microfinance institutions and microfinance associations to fully realize the potential of its platform. Eco Kargha Handicrafts Marketing Pvt. Ltd. is proud to announce that it has joined with Upaya Social Ventures to employ marginalized Tasar silk weavers in Bhagalpur, Bihar - a region commonly associated with the high-luster, strong, and lightweight fabric. With Upaya’s backing, Eco Kargha will hire and train slum-dwellers on new skills, techniques, equipment, and designs for producing wholesale Tasar silk as well as linen, cotton, and fine wool. Terms of the investment were not disclosed. “Bhagalpur weavers have long been regarded as artists creating magic on their handlooms, but have faced challenges in scaling up the industry beyond handicrafts,” said Dr. Ravi Chandra, Founder and Director of Eco Kargha. “With Upaya’s help, we will be able create systems that will impact thousands of weaving families in a sustainable manner,” he said. Bhagalpur is known for being the traditional home of Tasar silk products, and as many as 100,000 families are in some way involved in its production. However, while it is an increasingly popular material in men’s and women’s clothing, Tasar silk cultivation and production in the area remains very unstructured. The majority of people weaving Tasar silk do so as a secondary occupation as the linkages to tools, materials, training, and markets are not in place for weaving to be a primary livelihood for a significant number of people. Most Eco Kargha weavers qualify as ultra poor - generally living under $1.25 a day at the time of their hire – and over 50% belong to a backward caste, scheduled caste, or minority community. Furthermore, the United Nations Development Programme has identified Bihar as one of the states in India with the highest rates of domestic migration in search of work because of the lack of opportunities to earn a viable living locally. In August 2011, Upaya initiated a partnership with Samridhi Agri-Products to create steady employment for households living on less than $1.25 a day. Surveyed in early July 2012, this Midline Social Metrics report provides a snapshot of the progress out of poverty made by Samridhi’s 55 longest tenured employees. Before Samridhi’s arrival, these families could only rely on hard manual labor on construction sites or working someone else’s land to earn a meager living. One year later, Samridhi has created 104 new jobs rearing and milking dairy animals for ultra poor families who did not previously own cows or goats of their own. The company has also improved the livelihoods of an additional 220 dairy farming families in the same villages by providing higher, more reliable payments than the local middle men. For the purpose of this report, the employees have been separated into two groups. Group A includes those who joined the company in 2011, and Group B includes those who joined in the first three months of 2012. For both groups, baseline metrics (those collected prior to employment) and midline metrics (collected as of July 2012) are presented side-by-side for comparison. We are happy to report that both Group A and B have made good progress along certain indicators and we are seeing improvements to their quality of life. Both Groups A and B have seen an 80% reduction in households living below the $1.25 a day extreme poverty line. Group A’s average daily food expenditure quadrupled to nearly $0.81 following a 78% increase in households’ average daily income. Group B saw a similar rate of increase, with a 24% increase in income producing a 49% increase in average daily spending on food. Both groups report consuming a greater variety of grains and vegetables in the home. Upaya is proud to announce that it has joined with the Indian School of Business (ISB) for the fourth edition of iDiya, the ISB's National Social Venture Competition. Through the partnership Upaya staff will participate in the mentorship and judging phases of the competition. In addition, those iDiya entrants with strong potential to create jobs and improve the quality of life for the ultra poor will be simultaneously considered for participation in Upaya's LiftUP Project. iDiya accepts entries from small groups of working professionals in India. Teams submit an executive summary of their business ideas and plans, which are evaluated by student evaluators, faculty, investors and social VCs, and social entrepreneurs. Submissions are evaluated on various parameters, including measurable social impact, criticality of the social need and sustainability of the enterprise. In August of 2011, Upaya formalized its partnership with Samridhi Agri-Products to create steady employment for extremely poor women living on less than $1.25 per day. Through the LiftUP Project, Upaya is helping Samridhi develop scalable dairy operations and create hundreds of salaried jobs throughout Uttar Pradesh. In turn, these new positions will increase and stabilize household income for employees. This Social Indicator Baseline provides a snapshot of the living conditions for women employed by Samridhi at the time of their hire, and serves as a baseline for their progress out of poverty. Data will be gathered and reported on a semi-annual basis as a way of demonstrating positive change throughout the partnership. Upaya Social Ventures is proud to announce today a collaboration with Samridhi Agri-Products to establish community dairies that will create jobs and stabilize income for families living in extreme poverty. Launching in one of the poorest states in India, Uttar Pradesh-based Samridhi connects poor milk producers directly to the emerging formal dairy supply chain. With the goal of developing robust enterprise solutions to combat the problem of extreme poverty, Upaya Social Ventures is proud to announce today the LiftUP Project, a 24-36 month social business accelerator program for very early-stage, ultra poor-focused social enterprises. Demonstrating a strategy and commitment to serve the ultra poor (understood to be households living on less than $1.25 a day), social businesses selected for the program will have access to a supportive environment where they receive the funding and guidance to develop their business models. In 2011, the LiftUP Project will focus on businesses that will provide formal, steady employment for over 1,000 ultra poor families across states in North India considered the poorest in the country. "Too often we've seen good ideas with the potential to create real change 'die on the vine' because the entrepreneurs did not have access to the tools, skills, resources, and network connections that allow any business to scale," said Sachi Shenoy, Executive Director of Upaya Social Ventures. "Through the LiftUP Project, we've created a way for early-stage entrepreneurs to have access to professional management consulting services and flexible financing structures necessary for their long term success." The LiftUP Project works with an early stage idea and transforms it into a proven concept, one backed by stable in-field operations and social outcomes data, poised for scale and replication. "Upaya was founded on a vision of a world in which everyone can live a life of dignity and not struggle to meet their basic needs," said Melissa Lehman, Upaya Social Ventures's Board President. "What is so exciting for us about the LiftUP Project is the chance to support a new generation of entrepreneurs as they create opportunities for the millions of families to escape that struggle." For more information on Upaya and the LiftUP Project, click here.